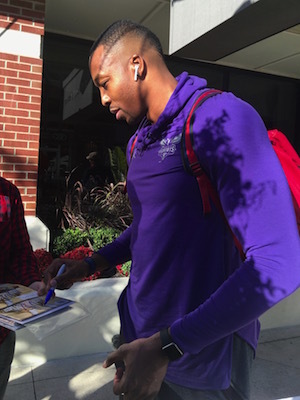 Here is an original photo of Hornets center Dwight Howard signing autographs outside of a Detroit area hotel. The shot was captured by Lance Martinez of My Detroit Sports. The Hornets represent Howard’s fifth team and third squad in just the last three years. Now in his 14th season, the Atlanta native began his career with the Magic, after being selected with the first pick in the 2004 NBA Draft. Howard led the Magic to the 2009 NBA Finals, losing to the LA Lakers in five games. In 2012, Howard was traded to the Lakers, where he played just one season prior to signing with the Rockets in 2013. Howard is an eight-time All-Star and three-time defensive player of the year. In this early season, Howard is scoring 15.2 points and grabbing 13.4 rebounds a game for the 5-6 Hornets. NBA fans can also view several other times Howard has signed autographs and interacted with fans over the years.